These financial advantages come at a time of heightened competitiveness in the post-acute market, with many facilities operating on razor-thin margins. Penalties for hospital readmissions are increasing, and the onset of the CMS’ bundled payments initiatives is expected to put post-acute facilities under even more pressure to demonstrate an ability to show value and save costs. 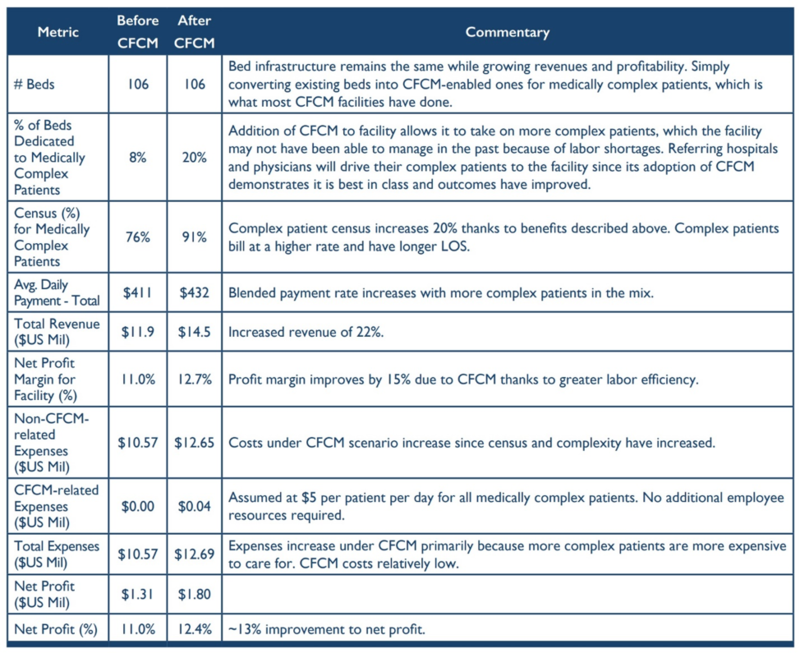 To put these cost savings into concrete terms, the white paper authors have created a model for calculating the return on investment (ROI) a “typical” post-acute facility can expect to see from deploying contact-free continuous monitoring, based on “the most reliable industry statistics” from sources like the CMS, the U.S. Government Accountability Office (GAO), the Kaiser Family Foundation and the New England Journal of Medicine (NEJM). To arrive at this ROI model, the authors assume an increase of 20% to the hypothetical facility’s complex patient census, pointing out that medically complex patients are estimated to bill at a rate 63% higher than non-complex patients, over a longer period (the length of stay could increase by as much as 75%). They also acknowledge that the facility’s expenses would increase by 20%, primarily due to the higher costs associated with more medically complex patients (and not from the costs of the CFCM solution itself). The total number of patients would decrease, but occupancy rates and average daily payment across all patients would increase. Although they’ve “historically pursued high-profit, low-risk patients,” the authors conclude, post-acute providers “can no longer afford to be selective about their mix of patients. They need to work aggressively to admit every possible patient while managing the risks associated with higher acuity patients.” And continuous monitoring is proving to be a powerful tool for doing just that.